FILE - Silver medalist Feyisa Lilesa of Ethiopia crosses his wrists in an attempt to draw global attention to recent deadly protests in his home region, Oromia, after the men's marathon at the 2016 Summer Olympics. When marathon silver medalist Feyisa Lilesa crossed the finish line at the Rio Olympics, he crossed his arms above his head in an "X", a sign of protest against the Ethiopian government's treatment of his people, the ethnic Oromo. "[I knew] I would be jailed or killed if not, I would [never be allowed] out of that country and allowed to participate in any international competition or race at all," Lilesa told the Thomson Reuters Foundation. "I am quite sure those things would happen to me," he said in a Skype interview from Rio, where he has been staying since Monday when the rest of his teammates returned to Ethiopia. 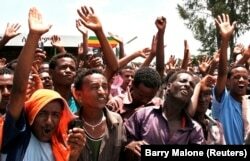 FILE - Demonstrators attend a rally in the Oromia region, May 15, 2010. Lilesa, 26, is one of thousands of Ethiopians estimated by activists to have left the country amid a security crackdown on demonstrations sparked by a conflict over land-use policies. Human Rights Watch estimated 400 demonstrators were killed by security forces between November and June during protests triggered by government plans to include some parts of Oromia within the capital Addis Ababa's limits. Up to 100 were shot in a single weekend in August when security forces also shut down the internet for 48 hours, according to activists. Lilesa's fear of being jailed upon his return home reflects the experiences of other Ethiopians who have spoken out against the government. 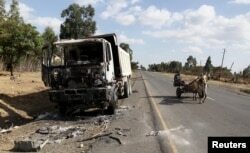 FILE - A man drives a horse-cart past the wreckage of a truck torched during recent demonstrations along the road in Holonkomi town, in Oromia region of Ethiopia, Dec. 17, 2015. A student from Haro Dumal city in Oromia, Ayimoo was arrested by authorities and imprisoned for a month last November after he attended several non-violent protests along with fellow students. "They used to take us out one by one, torture us with electricity and beat us badly," he told the Thomson Reuters Foundation. Ayimoo's family in Ethiopia paid a bribe for his release, later selling everything they had to get him to Europe. "I can't go back because I would lose my life," he said. Those in Athens are the lucky ones: Ayimoo's wife and baby girl drowned in April after the boat they were on crossing the Mediterranean from Libya sank, killing hundreds, according to survivors. "I could hear the screaming of my baby as I fell, I couldn't save my family," he said. "We became part of the whole protester story," said Jawar Mohammed, executive director of the network, which he said is watched by more than 11 million people in the Middle East and Africa at peak times. "I think the government is not ready for real reform the people are demanding right now. The people are tired of their false promises and will escalate their resistance," he said.